Strawberries are blooming, the rain is falling and it’s warming into the 60s and 70’—and as a plant pathologist, all I see is Botrytis spores dancing about the farm. We have already started to see Botrytis popping up on stem tissue and flower petals. Scouting for the pathogen in your fields will help inform you whether you need to spray. Preventing early flower and stem infections is critical to preventing Botrytis fruit rot. To scout, look for grey fuzzy spores on dead tissue, especially near the base of the crown and on dead flowers under or touching the plastic — the warmer temperatures with the plastic mulch encourage spore formation, even when it’s cool. Between the rains, fungicides are our main arsenal to protect plants against gray mold, especially during bloom. A large number of farms in the Mid-Atlantic region are experiencing problems with Botrytis strains (aka, individuals) that are resistant to one or more fungicides. The current status of fungicide resistance in the Mid-Atlantic is shown in the graph below, based on seven Maryland Farms (tests run by Clemson, from March – April 2016). Resistance to boscalid, which has been the more reliable of the two compounds in Pristine (most Botrytis stains are already resistant to the other Pristine product—pyraclostrobin, a strobilurin). This figure shows the percentage of Botrytis strains (aka, individuals) that are resistant to each fungicide, on each farm. Data courtesy of Dr. Guido Schnabel, Clemson University. Limit the number of times fungicides in the same class are applied in one year. It is recommended that all strobilurin (FRAC group 11, QoI) products not be used for Botrytis control. That’s Abound, Azaka, Cabrio, Pristine, Merivon and Quadris Top. On most farms throughout the east, these products are not effective against Botrytis, and are currently only recommended to control Anthracnose. To control both pathogens, this means that you need to combine a Botrytis-effective compound (like Captevate) with an Anthracnose-effective product (like Cabrio). Tank mix broad spectrum fungicides such as captan or Thiram with Topsin M — Topsin M no longer has Botrytis activity (as shown in the graph), but is helpful for several early season foliar diseases. The current recommendation is to rely on captan and thiram as your main protectants. ONLY add FRAC 7, 9, 17 or 19 to this base protectant ONLY IF you have high risk situations. High risk occurs when plants remain wet for at least 12 hours, with temperatures above 65°F. For now, you can estimate risk based on weather monitoring. We are currently working to bring a Botrytis and Anthracnose fruit rot risk evaluation tool to the Mid-Atlantic. This tool, called the Strawberry Advisory System, will provide text and/or email alerts to risk events. An example of a risk monitoring is shown below for the Western Maryland Experiment station, from April 7 to April 28, with a two day forecast from April 29-30. We are currently testing this system in Western Maryland, and plan to expand to grower field trials next year in Maryland, Pennsylvania and Virginia. SAS-based risk evaluation for Botrytis and Anthracnose fruit rot. It’s been a bumpy spring for strawberries. At least it sounds like we are out of the frost and freeze events. There’s always a silver lining. I have seen several strawberry fields in the past week that have some plants with distorted wrinkled appearing foliage (Fig. 1). These leaves almost look like they have a virus, but the new foliar growth looks normal. This damage is most likely due to cold injury we had sometime this frigid spring and does not pose much of a problem as far as yield or fruit quality. However, another cold injury to the strawberry plants was seen in these same strawberry fields. This damage can be best seen in small plants that do not seem to be growing as well as many of their neighbors. When these plants are dug out of the bed the roots still look good (i.e., white and firm), but if the crown of the plant is cut length wise then the problem is apparent (Fig. 2). The strawberry crown is actually a shortened plant stem. The central part of the crown, called the pith, is made up of large cells which are easily injured and turn brown because of the formation of ice crystals during winter or early spring. This central pith tissue is normally white and is sensitive to frost damage. Generally, minor freezing injury is characterized by a partial browning of the pith. However, with greater injury, the pith takes on a deeper shade of brown and the surrounding vascular layer turns brown or even black (Fig. 2). Any injury to the vascular layer will represent loss of later plant growth, since the food and water conducting elements located in this layer have been damaged. After you make the longitudinal cut you should make your assessment of the tissue quickly because in about 30 seconds, the entire pith area will become darker in appearance because of exposure to air—not necessarily because of tissue damage. Strawberry plants are quite resilient and even if there is internal cold injury to crown tissues plants can still recover, but the process could be slow and there will probably be some yield loss. This browning of the pith tissue also could be due to anthracnose, a plant disease. Anthracnose often causes a wilting of the plant and a reddish-brown area of the crown (Fig. 3). All the strawberry plants I saw with a brown pith were checked for anthracnose, which was not found. Growers should be sure to determine whether the brown tissue is due to cold injury or a disease. Figure 1. The distorted wrinkled leaves are showing signs of cold damage. The older and younger leaves around them are normal looking. Figure 2. The crown was cut length wise. The brown central pith tissue (arrows) has been damaged due to cold injury. Figure 3. Anthracnose in the crown of a strawberry plant. We have a very late crop of strawberries this year. Plasticulture strawberries are finally in full production but reports are that the crop is lower yielding this year. We had some heavy wind storms that shredded row covers earlier this year leaving plants unprotected until recovered. Wild honey bee activity is down due to winter bee kills so only pollination from rented hives has been effective. Cold windy and rainy weather has also kept bees from flying during some of the bloom period, also reducing berry size in some cases. 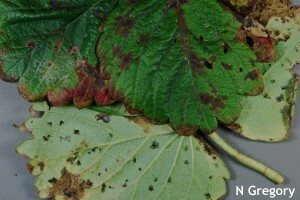 Another factor has been virus infected plants that growers received this past year. These plants originated from tips grown by a nursery in Nova Scotia. Several growers on Delmarva received virus infected plants from this source. Strawberry Mild Yellow Edge Virus (SMYEV) and Strawberry Mottle Virus (SMoV) were identified in these plants. 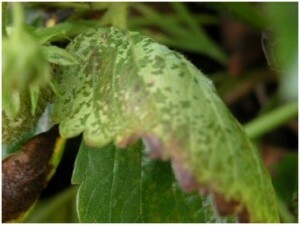 Symptoms included poor growth in some plants with older leaves turning red in color, leaf edges on new leaves showing a distinct yellowing, and some leaf margins becoming necrotic. We had frost in some areas on Monday and Tuesday and temperatures in the 80s expected later in the week. Because our strawberry crop is so late, strawberries are still blooming. These blooms have the potential to produce ripe berries in 4 weeks. To keep plants blooming and fruit setting during hotter periods where temperatures are in the mid-80s or above, cooling is advised. Run the drip irrigation very early in the morning and again in the afternoon to keep plants well watered and bed temperatures down. Evaporative cooling using mist or sprinklers can work but increases the risk of Botrytis, which may outweigh its usefulness. Shadecloth may be an option in smaller plantings and straw much over exposed black plastic can help keep beds cooler. Most growers should have had at least 2 fungicide sprays for Gray Mold on strawberries already in 2013. Gray mold is caused by the fungus Botrytis cinerea. The reservoir for this fungus is mycelium in dead strawberry leaves. This mycelium becomes active in the spring and starts to produce spores on this old leaf tissue which then spread to blooms. Most infections start at the bloom stage but symptoms usually do not develop until close to harvest (the fungus does not become active until the fruit enlarges). Ripening fruits can also be infected. Conditions conducive for infection are temperatures between 70 and 80°F and wet conditions (rain, dew, fog, irrigation. The most critical period for applying fungicides to control gray mold is during bloom. Start sprays at 5 to 10 percent bloom, because 90% of fruit infections occur through the flower, and repeat every 7-10 days. Increase spray intervals during persistent dry periods, but decrease intervals to 5-7 days during very wet periods. Four weekly sprays starting at 5-10% bloom are usually sufficient for season-long control. Tank-mix and rotate fungicides from different FRAC codes to reduce the chances for fungicide resistance development. If Botrytis is a problem it can often be traced back to poor sanitation (removing old leaves from plantings), mistiming of bloom sprays, or a combination of the two. However, we are seeing resistance of Botrytis to several fungicides. If fungicide resistance is suspected, resistance testing may be warranted. There is a laboratory at Clemson University that is doing Botrytis resistance testing. There have been several samples from DE and MD with angular leafspot that have been diagnosed this spring. As you can see from the picture this bacterial leafspot produces angular watersoaked spots initially (Figure 1) that turn dark and eventually brown with time (Figure 2). The bacteria are limited by the vein pattern in the leaf which gives it the diagnostic angular pattern. This disease can cause leaf loss, and when conditions are very favorable during fruit set, the calyx can become infected and that can reduce the marketability of the fruit. Wet conditions favor the disease, especially if irrigation is needed for frost protection. The bacteria that cause the spring symptoms come from systemically infected overwintered plants and dead leaves, and from infected transplants. Copper sprays can be effective in limiting spread once it is identified but over-application can be phytotoxic, so be careful. Prevention of angular leafspot in the plant nursery and its dissemination in transplants is crucial to controlling this disease. With September strawberry planting season approaching for the annual plasticulture system, growers will be preparing beds and fumigating in the next 2 weeks. While several chemical fumigants are registered for strawberries, new fumigant use restrictions will make their use more of a challenge. In addition, strawberry growers that are organic or are using high tunnels with limited rotation are looking for effective fumigation alternatives. One natural fumigant alternative that has shown great promise is mustard seed meal. According to researchers Dean Kopsell and Carl E. Sams, “studies conducted at The University of Tennessee showed that mustard seed meal has extremely high concentrations of isothiocyanates (ITCs). The seed meal is also a fertilizer source of nitrogen and other nutrients. When incorporated into the soil, ITCs act as effective biofumigants, reducing populations of pathogenic fungal species (Sclerotium, Rhizoctonia, Phytophthora, and Pythium), nematodes, weeds, and certain insect species.” ITCs are the same compounds found in some commercial chemical fumigants. Specific studies with strawberries showed yield increases of as much as 50% compared to untreated controls using mustard seed meal. Additional research is going on in the region (Virginia, Maryland, Delaware, and Pennsylvania) with this material. For mustard seed meal to be effective as a fumigant it has to be thoroughly worked into the bed area and plastic layed immediately after incorporation. The bed must remain evenly moist so the meal can break down (dry pockets will have delayed break down and can cause problems later) so a moist soil is important. A waiting period of 20 days is advised similar to a commercial fumigant before planting. Current supplies of mustard seed meal come from Tennessee and costs $1.00-1.20 per pound. Recommended rate is 1000 lbs per mulched acre. Because mustard seed meal is a natural compound, fumigant restrictions do not apply. It is also OMRI certified for organic production. Pristine (pyraclostrobin + boscalid, 11 + 7), Cabrio (pyraclostrobin, 11) or Abound (azoxystrobin, 11) before switching to another fungicide chemistry. Botrytis (gray mold) and blossom blight can cause serious losses in strawberry plantings in high tunnels and the field if not controlled properly. Development is favored by moderate temperatures (59 to 77°F) with prolonged periods of high relative humidity and surface wetness. Control of gray mold begins with preventative fungicide applications. Apply at 5 to 10% bloom and every 10 days until harvest. During periods of excessive moisture, spray intervals of 5 to 7 days may be necessary. Rotate fungicide chemistries to aid fungicide resistance management. Switch (cyprodinil, 9) at 11.0 to 14.0 oz. 62.5WG/A. 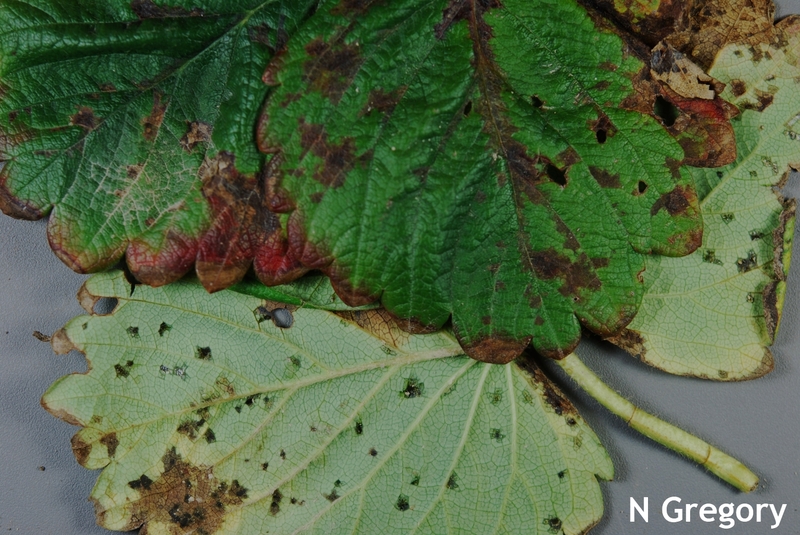 There have been two samples of angular leafspot that have been diagnosed this spring. One sample was from high tunnel production, the other annual strawberry under row covers. As you can see from the picture this bacterial leafspot produces angular watersoaked spots initially (Photo 1) that turn dark and eventually brown with time (Photo 2). The bacteria are limited by the vein pattern in the leaf which gives it the diagnostic angular pattern. This disease can cause leaf loss, and, when conditions are very favorable during fruit set, the calyx can become infected and that can reduce the marketability of the fruit. Wet conditions favor the disease, especially if irrigation is needed for frost protection. The bacteria that cause the spring symptoms come from systemically infected overwintered plants and dead leaves, and from infected transplants. Copper sprays can be effective in limiting spread once it is identified but over-application can be phytotoxic, so be careful. Prevention of angular leafspot in the plant nursery and its dissemination in transplants is crucial to controlling this disease. Photo 2. 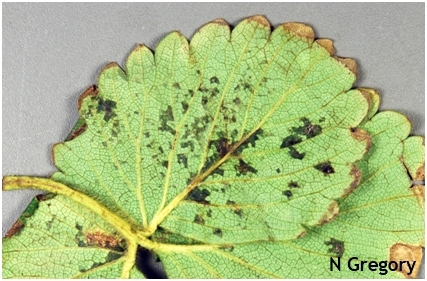 Angular leafspot symptoms.